Here's part 2 of our tour! 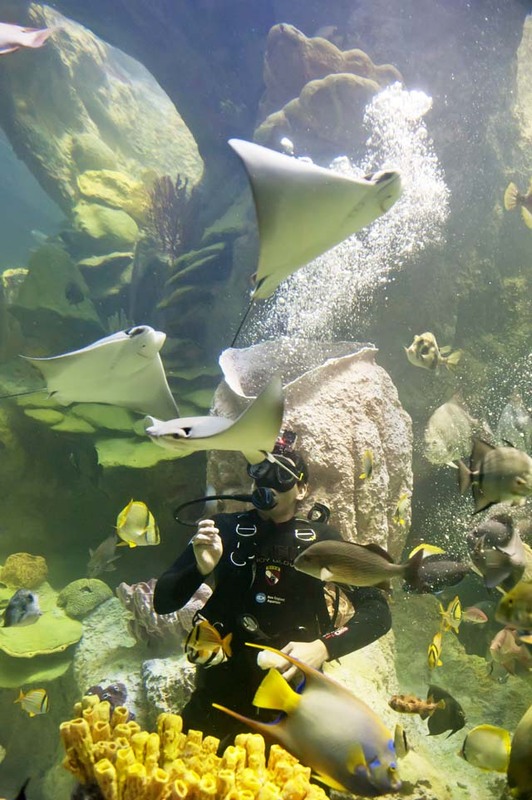 Follow around two of our three species of stingrays in the Giant Ocean Tank. Southern stingrays, Dasyatis americana, are benthic elasmobranchs, spending most (but not all, as seen in the video) of their time on the bottom in sandy areas. They have 1 or 2 venomous spines on their tails which are used for defense only. They are common in the Caribbean but also found in the Gulf of Mexico and in Atlantic waters north to New Jersey and south to Brazil. They are members of Family Dasyatidae (stingrays). Cownose rays, Rhinoptera bonasus, are pelagic elasmobranchs, swimming mainly in the water column but descending to the ocean floor to feed on invertebrates. They get their name from their cow-like snouts, and although they are in a different family from the southern stingray, they too have venomous spine(s) on their tails. They formerly were classified in Family Myliobatidae (eagle rays) but now are members of Family Rhinopteridae (cownose rays). It's definitely taking me some time to get used to the new interior of the Giant Ocean Tank. A new coral head here, some new lettuce corals there, oops I just swam into some tube sponges, you get the picture. 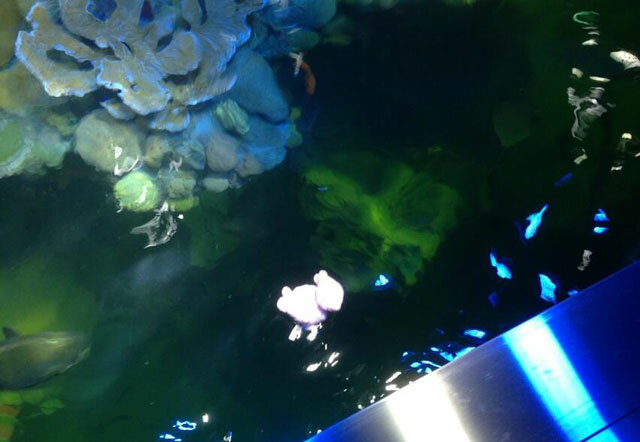 I was wondering how the fish were navigating their new digs. So I followed some fish around with my camera, including this really cool peacock flounder. 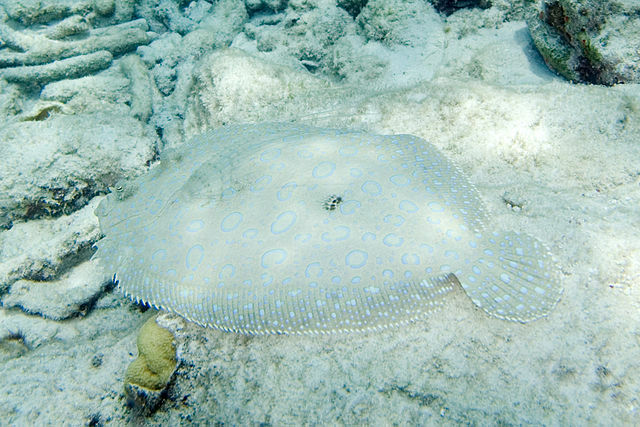 Peacock flounders (Bothus lunatus) are bottom dwellers and are masters of camouflage, having the ability to rapidly lighten or darken their colors to blend with the bottom. They, like all lefteye flounders in the Bothidae family, have both of their eyes on top of their head, which is actually their left side because they lie on their sides, not their stomachs, making their pectoral fin look like a dorsal fin. What's really cool is that they have typical bilateral fish-shaped bodies with an eye on each side of their heads when in their pelagic (or open water) larval stage, and when growing into a benthic (or bottom dwelling) juvenile one eye migrates to the other side! That amazes me. 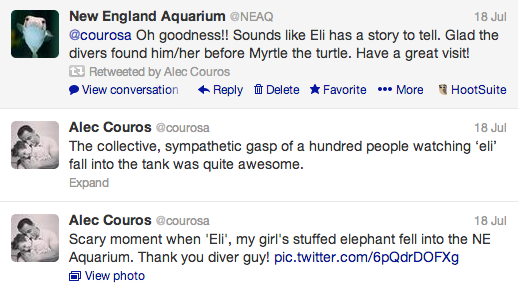 Check out more underwater videos of the big tank! 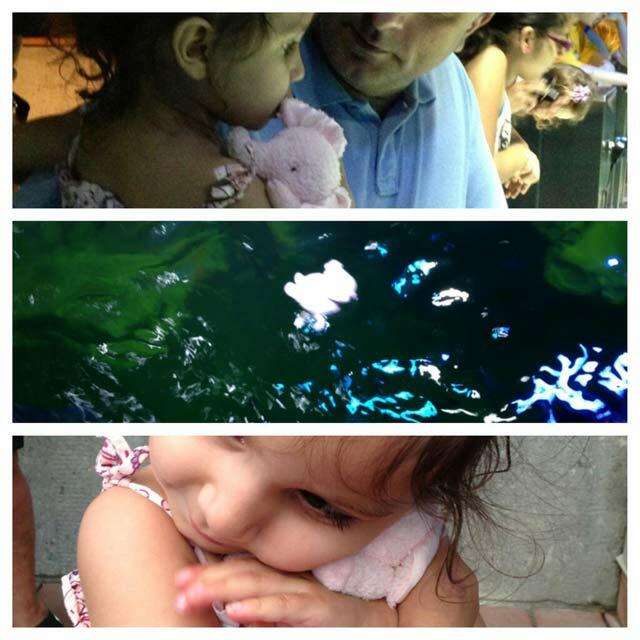 Come look for the peacock flounder inside the Giant Ocean Tank! Visiting has never been easier. Choose the day and time you wish to visit with timed ticketing. It's been a long 10 months, and all our efforts have been working toward this day. We have so much to tell you about the new exhibit, but just for today—the official debut of the new tank and all the new exhibits throughout the Aquarium—here's a view from the inside. 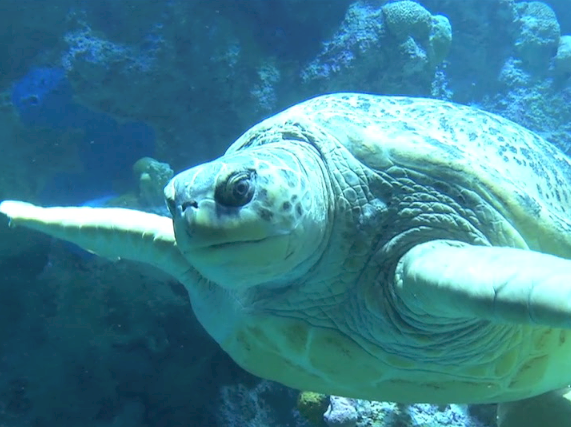 Sit back and enjoy, this video is chock-full of cool animals. 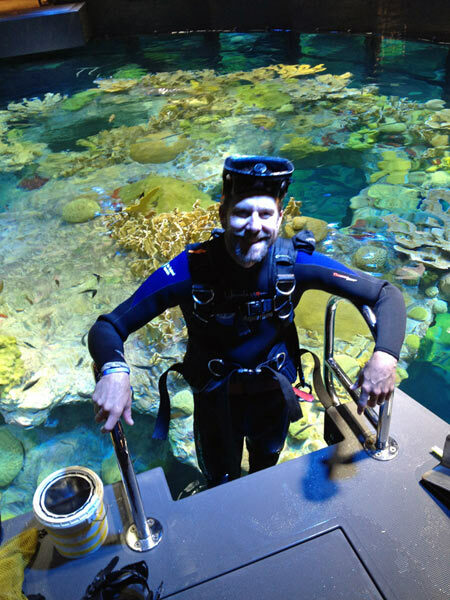 While our attention and pride is focused on the Giant Ocean Tank (it is our office, after all), today's celebration is about the New England Aquarium as a whole. 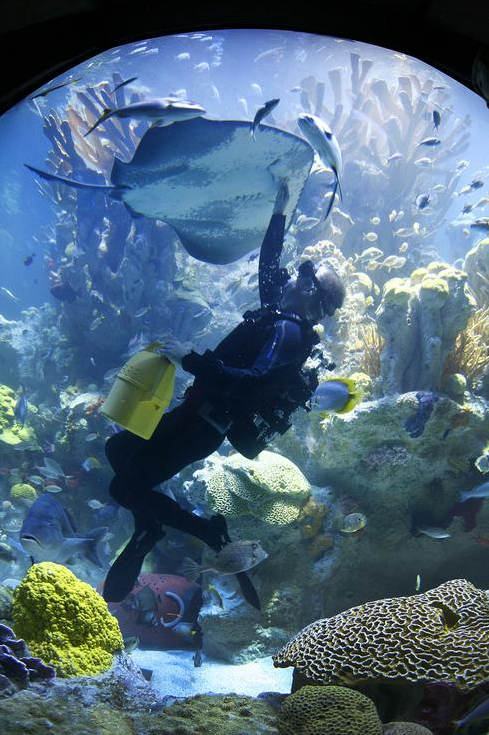 We're calling it the New Aquarium Experience because visitors will notice changes all throughout the building. Buy your tickets online in advance for the entry time that right for you.